Cheekbone enhancement is one of my favorite procedures! It’s one of the easiest ways for women in the their late 20’s to early 40’s to refresh their looks without anyone suspecting that they had something done! When performed properly, cheekbone augmentation is so beautiful and natural that everyone will think you look “prettier”, but no one will know why. You’ll suddenly have a gorgeous highlight to apply blush, a plump “apple” when you smile, and your under eye hollows will be a thing of the past! Keep Reading to find out the Top 4 Ways to enhance your cheekbones! Men are having more cosmetic surgery! According to the American Society for Aesthetic Plastic Surgery, more and more business men are having cosmetic procedures to stay ahead of their competition in the workplace. Both surgical and nonsurgical procedures are increasing in popularity with men, but Botox and Injectible Soft Tissue Filler treatments, such as Juvederm, Restylane, Radiesse, and Sculptra, are standing out from the crowd. There is a growing group of men who believe that looking younger and healthier gives them a competitive advantage in making sales deals, obtaining a promotion, or securing a new job. Are “raccoon eyes” ruining your beauty routine? Are you tired of being asked if you’re tired? Dark under eye circles are a frequent annoyance. For some of us they appear after a night of too much fun or too much stress, and for others they are chronic. But why? There are as many causes for dark circles as there are solutions so let me help to navigate the noise. Read on as I shed some light on those dark under-eye circles and give you the top three tips to get rid of them! 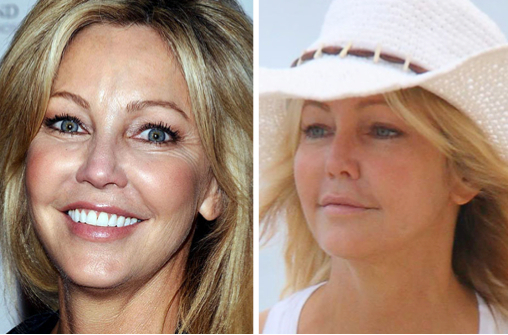 Perpetually youthful celeb Heather Locklear was recently spotted with a newly puffy face. Did she have filler or fat injections to plump things up a bit? We think so!